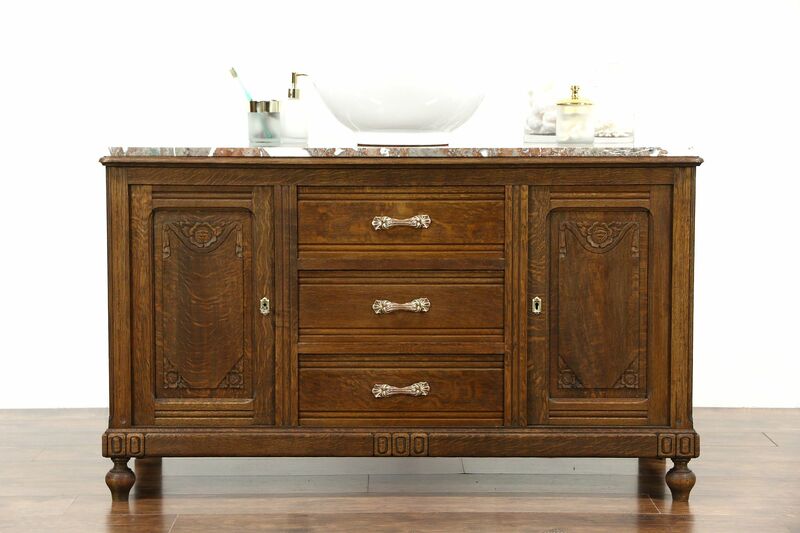 A richly detailed sideboard, server, bar or buffet was hand carved of solid oak in Belgium about 1915, and would make a wonderful vessel sink vanity. The original finish is very well preserved and has been waxed and buffed, so all that is needed to maintain the soft luster is an occasional wipe with a a soft dry cloth. Embossed hardware is original, door locks work. The marble has been polished and sealed to resist stains. Panels are raised on this sophisticated antique furniture. Measurements are 52" wide, 22" deep and 31" tall.